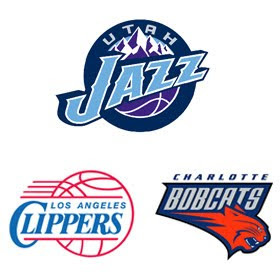 It’s still preseason, so I’m going to be lazy and combine the recaps of Utah's two games over the weekend versus the Clippers and Bobcats. The Jazz lost to LA 103-96 on Saturday but then bounced back to beat Charlotte 110-103 the following night. Game ball goes to: Carlos Boozer. He scored 42 points in only 45 minutes between the two games, shooting a combined 18 for 26 (69%) from the field. Boozer also looked much more active on defense than in previous years. He seems to be solidifying his starter status at PF. Stat of the game(s): Eric Maynor continued a rather interesting streak by nabbing two steals against both the Clippers and the Bobcats. The rookie has recorded exactly two steals in each of Utah’s six preseason games thus far. Highlight: Kirilenko returned from a two-game absence on Sunday, shaking off jetlag to post his best outing of the preseason with 18 points, 6 rebounds, 4 assists, a block and a steal. Lowlight: The Jazz still can’t stay healthy. In addition to CJ Miles who will be out at least six weeks, Mehmet Okur (back), Kyle Korver (knee), and Ronnie Price (hamstring) all missed Sunday’s game with minor injuries. - Koufos and Fesenko both logged the most minutes they had seen all preseason, and both responded with their best games thus far. The pair has been relatively disappointing up to this point. The Jazz really need one or both of them to step up this season. - Maynor continues to struggle with his shot (1 for 6 Saturday and 3 for 11 Sunday), but the rest of his game is definitely far ahead of what I expected. Looks like he will legitimately challenge Price for the backup PG role. - Even though his preseason numbers haven’t been gaudy, Deron Williams routinely looks like the best player on the court. Ahhh, Korver's knee? When's he coming back...? Not sure. He sat out again on Tuesday against the Blazers. He is listed as "day to day." My guess is he'll probably sit out again fro the preseason finale on Friday, but he'll be ready to go for the regular season opener on the 28th.